Venice MainStreet, Inc. Board of Directors, a 501(c)3 non-profit organization, is pleased to announce, it has established an endowment fund through the Gulf Coast Community Foundation. 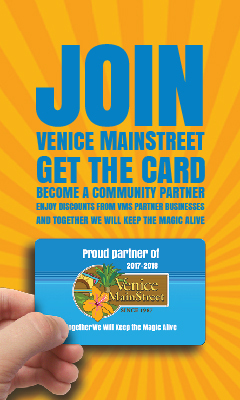 The purpose of this fund is to support future community projects that enhance the Venice Community and ensure Venice MainStreet thrives for decades to come. The Venice MainStreet Board of Directors is committed to accountability and transparency for the protection of every community investment. Significant steps have been taken to ensure the safety of these investments and multiple board actions are required to withdraw any endowed funds. A donation also enables this 31-year-old community organization to weather the inevitable ups and downs of the broader economy. For more information, contact Venice MainStreet CEO, Erin Silk at 941-484-6722 or Erin@venicemainstreet.com.